This time of year as the weather gets colder and colder, the relaxing crackle of burning wood and cozy warmth of dancing flames make the long evenings indoors more enjoyable. If you didn’t grow up using a wood burning fireplace or stove, building a good fire can be a challenge. In this post we’ll provide something of a wood burning guide to help you ignite a comfortable blaze in your hearth. Fire is the product of a chemical reaction. Knowing the key components that spark a flame will help. Heat, fuel and air (or oxygen) are referred to as the “fire triangle” or “combustion triangle.” These three ingredients are the recipe for fire. As you follow the follow five steps to build a fire, keep the fire triangle in mind. Collecting fuel for your fire is the first step. If you want your fire to burn longer than a few minutes, you will need to gather kindling, tinder and seasoned firewood. To ensure your firewood is dry, consider using a moisture meter. Its impossible to know how dry your wood is without testing it. Kindling is material that lights easily and burns quickly. It’s used to catch tinder on fire. Tinder burns hotter and longer than kindling, it helps the logs of seasoned firewood to ignite. Black and white newspaper is excellent kindling (do not use coloured or glossy newspaper as they release toxic fumes when burned and produce excess creosote). 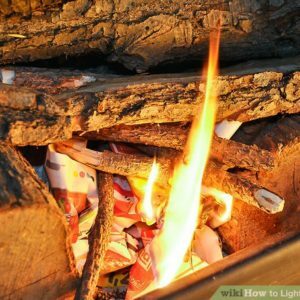 Small, dry sticks can also be used as kindling. Seasoned soft woods, like pine or cedar, which have been cut into thin logs or larger sticks are excellent for tinder. Friendly Fires also stocks natural firestarter that helps as well. The firewood that you choose will determine the type of fire you enjoy. Logs of both soft and hardwoods can be used in fireplaces. Softwoods light more easily but do not burn as long or hot as hardwoods. If you want a milder, shorter burning fire, use softwoods like Douglas fir, yellow pine, white spruce or any kind of cedar. If you want a hotter, longer burning fire, choose hardwoods like birch, red oak, hickory, or pecan. You should always burn seasoned, or dry, firewood that has been kept in a dry place for 24 months after the tree was cut down. Burning moist or wet wood creates a large amount of smoke and little heat. Unseasoned wood also produces more creosote. The National Fire Protection Association (NFPA) recommends that you NEVER burn yard debris, such as bags of leaves, in your fireplace either because it is a common cause of house fires. Fireplaces are not designed to burn yard debris and many trees that are planted in yards do not make good firewood. Air is the component in the fire triangle that is often overlooked. Creating an adequate draft for your fire is as essential as collecting fuel. If you are having trouble lighting a fire in your fireplace, the problem may be that there isn’t enough air. Before building a fuel pile, be sure to take the second step and open the damper in your fireplace (if applicable) to create a draft for your fire. If your wood stove is not creating enough draft, consider trying a new electric collar – these help create draft without any smoke. If you have a new home that is tightly insulated, you may need to crack a window as well to have enough air for your fire. In that case, you should eventually talk to a professional chimney sweep for a more permanent solution to ensure your family is not at risk of carbon monoxide poisoning. Once you have enough air flow, arranging the kindling, tinder and firewood into a pile in your hearth. The bottom layer of this fuel pile should be kindling. Tinder should be place on top of the kindling in a crisscross pattern with space in between the stick or thin logs so that air can circulate. The larger logs go on top. Space should also be left in between the logs so that air can move between them and feed the flames. How you arrange your logs of firewood actually affects the fire’s duration. For a slow-burning, hot fire, pack your firewood more tightly and use large pieces of hardwood (but be careful not to overload your fireplace). For a shorter, milder fire, stack three smaller pieces of firewood loosely together in a crisscross pattern. A load that is stacked loosely is good for short or “flash” fires. A fuel load that is compact is good for longer fire cycles. A match or long reach lighter should be used to ignite the kindling. Do NOT use any ignition liquids or accelerants like lighter fluid, gasoline or kerosene. Along with being unnecessary, they can cause an explosion and a house fire. If you have faithfully followed steps 1 through 4, the kindling and tinder will catch the seasoned logs on fire. You will be able to lounge near your top rated wood burning fireplace and enjoy the roaring blaze. When more fuel is needed, carefully put another log into the hearth. Be sure not to leave the fire unattended while it is burning. Don’t forget to check out our Wood Accessories section for Tools & Toolsets, Log Holders & Grates, Kettles & Steamers, Fireplace Screens, Safety Gates & Spark Protection, Maintenance, Gaskets & Cleaners, are more!